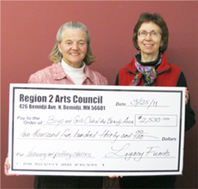 Region 2 Arts Council (R2AC) recently awarded $54,083 through the Arts and Cultural Heritage Grants Program, to individual artists and non-profits in Beltrami, Clearwater, Hubbard, Lake of the Woods and Mahnomen counties. The funds will be used to create opportunities for arts access, arts education, and building bridges between Minnesotans and were made available through an appropriation by the Minnesota State Legislature Arts and Cultural Heritage Fund passed by Minnesota voters on November 4, 2008. Clear Waters Life Center, Clearbrook was awarded $6,000 to assist in establishing Art & Drama classes on “Art Mondays” at the Clear Waters Life Center’s Gonvick Visual and Performing Arts Center for youth and adults. Lake of the Woods School, Baudette, received $4,990 to hire Don Houseman to teach printmaking to 8th through 12th grade art students for 10 days, culminating with a public show of the students’ work. Paul Bunyan Playhouse, Bemidji, was awarded $6,000 to assist in supporting the Paul Bunyan Playhouse Professional Summer Theater 2011. Minnesota Folklore Theater, Akeley received $4,355 to present a children’s theater arts camp June 19-26, 2011 in Akeley, MN. Beltrami County Historical Society, Bemidji was awarded $3,825 to produce “The Middle Years 1941-1963,” a 56-minute TV documentary of Bemidji and Beltrami County, which will combine historic overviews of world events and the relationship to our community. Red Lake Nation Boys & Girls Club Unit 2 Ponemah, Ponemah received $5,200 to encourage youth and elders to participate in community art projects to help promote the well being of their culture through hands-on experience and verbal awareness. Boys & Girls Club of the Bemidji Area, Bemidji was awarded $2,530 to offer courses for club members, aged 6-18, to learn to draw using charcoal pencil and to learn the basics of pottery on two tabletop potters wheels. Independent School District #162, Bagley received $947 to assist Bagley High School Seniors and Drama Club Members to attend the Guthrie Theater production of Shakespeare’s “A Winter’s Tale” in Minneapolis. 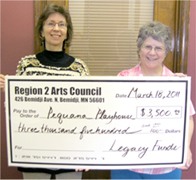 Pequana Playhouse, Baudette was awarded $3,500 to purchase a professional quality programmable full-size electronic keyboard to be used in rehearsals and performances. Headwaters Center for Lifelong Learning, Park Rapids received $3,340 to offer opportunities to experience the work of regional and local poets at four poetry readings and to attend a play about classic American poet Emily Dickinson. Bemidji Symphony Orchestra, Bemidji was awarded $6,000 to host a performance with Carol Wincenc, a world-renowned flute soloist, who will also provide a master class to regional music students and symphony players. Park Rapids Lakes Area Arts Council, Park Rapids was awarded $4,400 to produce “Art Leap 2011”, a 2-day open studio event, including a driving tour of artists’ studios and other cultural destinations, live performances and a variety of workshops. Audrey Thayer, Bemidji was awarded $2,996 to create “Homelessness,” a photography exhibit of the human faces of the homeless.